Are the globes present in the orbits? An enucleation of his left eye is pictured in Figure 10-15. The removal of the entire globe from the orbit may be caused by trauma, surgery (as in the case of a ruptured globe), or self-induced injury by a psychotic person. Examine the eyelids for evidence of drooping, infection, erythema, swelling, crusting, masses, or other abnormalities. Have the patient open and close the eyelids. The motion should be smooth and symmetric. Do the eyes close completely? Note the position of the eyelids. When the eye is open, the upper eyelid normally covers only the upper margin of the iris. When the eye is closed, the eyelids should approximate each other completely. The space between the upper and lower lids is the palpebral fissure. Drooping of the eyelid is known as blepharoptosis, or ptosis. Figure 10-16 depicts marked bilateral ptosis, causing narrowing of the palpebral fissure that resulted from a muscle-weakening disorder, myasthenia gravis. Figure 10-15 Enucleation of left eye. pigmentary degeneration and cardiac conduction defects such as complete heart block. Affected patients are frequently of short stature and may be deaf. In this patient, notice the arching of the brows in an effort to lift the eyelids to reduce the ptosis. Lagophthalmos is a condition, pictured in Figure 10-18, in which there is an inability to close the eyelids completely. It is seen in thyroid disease secondary to orbital infiltration caused by inflammation, as a result of autonomic stimulation, or as a consequence of ocular surgery. The name comes from the Greek word lagos, meaning ''hare,'' an animal believed to sleep with its eyes open. Figure 10-19 shows a patient with an entropion. An entropion is a turning inward of the lid margin in such a way that the eyelashes abrade the cornea and globe. An ectropion is a turning outward of the eyelid margin. An ectropion is pictured in Figure 10-20. Both entropions and ectropions may be seen as involutional changes associated with aging. A common benign lesion of the eyelid is a marginal intradermal nevus, shown in Figure 10-21. 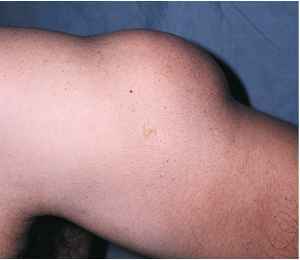 Such lesions are well differentiated, and hairs commonly grow from them. One of the associated problems is that these hairs may scratch the cornea, causing corneal abrasions like those caused by entropions.